Pom To The Rescue "Scary Facts"
Cocoa Mulch, which is sold by Target, Home Depot, Foreman's Garden Supply and other garden supply stores contains a lethal ingredient called Theobromine (see below). It is lethal to dogs and cats. It smells like chocolate and it really attracts dogs. They will ingest this stuff and die. Several deaths already occurred recently. 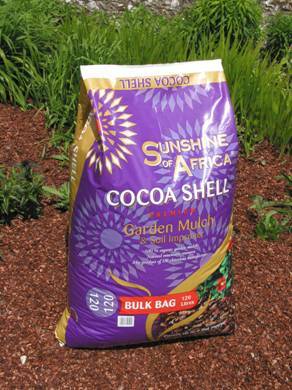 The doting owner of two young lab mixes purchased Cocoa Mulch from Target to use in their garden. The dogs loved the way it smelled and it was advertised to keep cats away from their garden. Their dog (Calypso) decided the mulch smelled good enough to eat and devoured a large helping. She vomited a few times which was typical when she eats something new but wasn't acting lethargic in any way. The next day, Mom woke up and took Calypso out for her morning walk. Half way through the walk, she had a seizure and died instantly. Although the mulch had NO warnings printed on the label, upon further investigation on the company's web site …this product is HIGHLY toxic to dogs and cats. Theobromine is in all chocolate, especially dark or baker's chocolate which is toxic to dogs. Cocoa bean shells contain potentially toxic quantities of theobromine, a xanthine compound similar in effects to caffeine and theophylline. A dog that ingested a lethal quantity of garden mulch made from cacao bean shells developed severe convulsions and died 17 hours later. Analysis of the stomach contents and the ingested cacao bean shells revealed the presence of lethal amounts of theobromine. 75% of animals found within a shelter were original placed in homes by their owners. 40% of animals within shelters are purebred. 2 million dogs are stolen from their own yards, in broad daylight each year . 6-8 million dogs/cats will visit an animal shelter each year. 4.6 million dogs/cats are euthanized each year. Only 15% of dogs within shelters are ever reclaimed by their owners. Each day 10,000 humans and 70,000 puppies and kittens are born. For every puppy that you "buy", you are supporting a market where animals are treated as a product - a commodity to be bred and sold for profit (i.e. puppy mills/commercial breeding facilities/backyard breeders). Only 1 out of 10 puppies born, will live to see a full life. Maybe you are that one responsible person who will make a life long commitment to your pet store puppy, but you may not realize that 9 other dogs will have to suffer because of your purchase. You will never see them or know them or hear of their fate - but it is the reality of animal breeding.